The word “interrogation” has been appearing in descriptions of high-content analysis, and no wonder: High-content analysis is the cellular version of the proverbial wide-ranging investigation. High-content analysis could even be seen as a kind of elaborate simulation, or even a sting operation, one in which living cells are used to create physiologically relevant models so that potential drugs, from small molecules to biologics, may be assessed for therapeutic or toxic potential. Close surveillance ensures that many phenotypic changes are captured simultaneously. Without high-content analysis, investigators may resort to traditional cellular assays, which are often labor-intensive and cumbersome. Worse, they often fail to accurately model the biology of the system. Consequently, more complex assays are being adapted to high-content platforms, including 3D assays. Combining such assays with automated platforms and high-content imaging technologies has allowed researchers to interrogate complex biological systems much more powerfully and accurately than ever before. As these investigative tools become more widely available, what hidden interactions may come to light? To answer this question, scientific investigators will gather at the 16th annual High-Content Analysis conference, a Cambridge Healthtech Institute event that will be held June 20–21 in Boston. For a preview of this event, GEN asked some of the scheduled presenters to describe how they are using high-content analysis to uncover complex biology. Many potential cancer immunotherapies are trying to reduce tumor-mediated immunosuppression and increase cytotoxic T-cell activity. For example, some cancer immunotherapies are designed to prevent tumors from attracting immunosuppressive lymphocytes or secreting immunosuppressive cytokines. And some cancer immunotherapies are designed to activate cytotoxic T cells and natural killer cells. To improve the assessment of potential therapies, Shane Horman, Ph.D., a researcher at the Genomic Institute of the Novartis Research Foundation, has developed an ultra-high-content platform for interrogation of T cell–mediated killing of tumor spheroids. The platform, which produces clinically relevant multiparametric data, uses peptides to stimulate T cells from peripheral blood mononuclear cells. According to Dr. Horman, the peptides are derived from antigens associated with common viruses. The antigens are recognized by T cells, which expand into a population of CD8-positive memory T cells. Getting the right T-cell population takes about nine days. These T cells are then added to 3D tumor spheroids of human colorectal cancer cells that have been propagated in the wells of a 1,536-well microtiter plate. At this point, investigational compounds are added to the plate. After the incubation period—typically three days—high-content imaging is used to observe changes in target variables such as the size and shape of the spheroid, the size of the T-cell population, and degree to which T cells penetrate the 3D structure. In addition to screening drug compounds, the platform can identify new drug targets and new mechanisms that can be exploited for therapy. Dr. Horman suggest that the platform can also be used to study T-cell infiltration into the tumor. At the Genomics Institute of the Novartis Research Foundation, scientists led by Shane Horman, Ph.D., have developed a microphysiological assay that quantitates T cell–mediated killing of 3D tumor spheroids. In these high-content images, 3D tumor spheroids (green) are surrounded by T cells (red). The control sample (left) shows a large, healthy tumor spheroid with no T cell–induced damage. The hit compound sample (right) shows potent antitumor T-cell activity. The team embeds cells within extracellular matrix biomaterials. It accomplishes this task by using 3D printing or by mixing the cells with specialized polymers. One common material used by the team is a hydrogel that consists of hyaluronic acid and gelatin, which mimics native extracellular matrix. When the multiple organoids are interconnected, they form a compact system, one small enough to fit on a 3×1-inch microscope slide. Dr. Soker says that each organoid in the multi-tissue organ-on-a-chip system contains many of the cell types normally found in that organoid’s in vivo counterpart. The cells are fed by a microfluidic system that circulates liquid containing many of the nutrients normally present in blood. Each organoid in the system is placed in a small chamber; the chambers are connected by channels through which the fluid circulates, and the flow of the fluid is controlled by a valving system. Then, if a compound is introduced into the system, it can be processed in a way that models the body’s circulation. For example, if a compound is ingested, it enters the liver for initial metabolism, and then the modified compound is transported by the bloodstream to other organs and tissues. Sequences of events such as this can be modeled exactly using the channels and valves of the multi-tissue organ-on-a-chip. Scientists at the Wake Forest Institute for Regenerative Medicine are developing an integrated multi-tissue organ-on-a-chip platform to advance drug and toxicology screening. (A) A six-organoid microfluidic system showing media circulation between the different organoid-containing chambers. 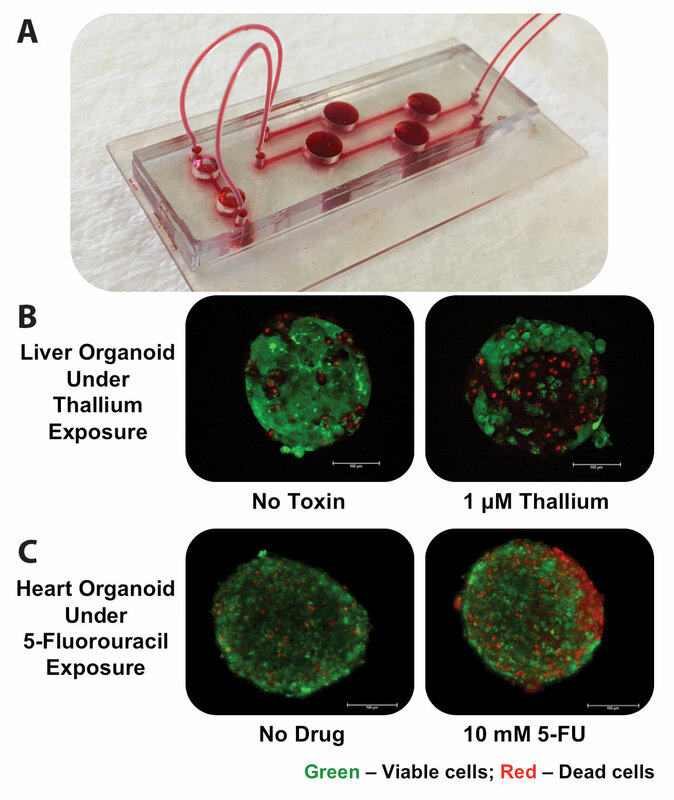 (B) Cell viability in liver organoids treated with the environmental toxin thallium. (C) Cell viability in cardiac organoids treated with the chemotherapeutic 5-fluorouracil. In her presentation, Denise Barrault, Ph.D., executive director of the United Kingdom’s National Phenotypic Screening Centre (NPSC), intends to discuss the NPSC’s Phenomics Discovery Initiative (PDi), a public-private consortium that de-risks phenotypic assays for development, screening, and validation. The PDi selects innovative precompetitive assays relevant to human disease and develops them to run on the NPSC’s industry-standard screening platform. “The HBEC assay is a very complex and involves differentiating cells into the varied types found in the bronchus, including the ciliated cells,” informs Dr. Barrault. “The cells feed from medium, which is held under the tissue structure, and the top layer is made up of ciliated cells, which move mucus along the bronchus.” According to Dr. Barrault, for the model to be relevant to the physiology of the human body, the cells must not only produce mucus, they must also grow at an air-liquid interface. The high-content aspect of PDi’s assays is in the number of parameters that can be measured simultaneously during screening. In high-content screening, many thousands of variables can be captured at once, such as the shape of the nucleus, the size of the cells, the size of the organelles, the features of the cell surface, and the chosen markers. A process of cell profiling using imaging-analysis software and artificial intelligence then allows certain parameters to be associated with a particular phenotype (diseased versus healthy, for example). High-content screening identifies compounds that convert the diseased phenotype into a healthy one, as starting points for drug discovery campaigns. Timothy Majarian, currently a computational associate at the Broad Institute, plans to present an image-analysis technique he developed with Robert F. Murphy, Ph.D., head of the Computational Biology Department at Carnegie Mellon University. The technique characterizes the spatial dependence of punctate-like, or point-like, objects within cells. Punctate-like objects may be vesicles or other cytoplasmic complexes that resemble vesicles. The technique adapts point process modeling, a statistical technique that has been used to analyze spatial data in fields such as seismology, materials science, and human epidemiology, as well as biology. In general, point process modeling looks for patterns in the observed locations of events that occur in multidimensional space. In cell imaging, the observed locations correspond to the positions of punctate-like objects within the cytoplasm. Mr. Majarian and Dr. Murphy used the technique to show that the distribution of punctate-like objects may depend on structural elements such as nuclear membranes, cell membranes, and microtubules. These investigators also recognized punctate protein patterns among previously uncharacterized proteins. “We were one of the first groups to use this type of modeling for high-throughput cell imaging,” asserts Mr. Majarian, who adds that adapting point-process modeling to cell imaging required the investigators to devote a lot of attention to the preprocessing stage, which involves tasks such as segmenting individual cells. “The real difficulty is achieving a high degree of accuracy, especially if incoming data is of variable quality,” advises Mr. Majarian. Point-process modeling is complementary to image-analysis methods for dissecting subcellular compartmentalization and trafficking, notes Mr. Majarian, and it is likely to be applicable to further studies of spatial relationships among cellular components.